Seoul, South Korea has always been on my travel bucket list so I reached out to my good friend who grew up there, YKK for her recommendations on things to see, eat and do. South Korea was one of the places I failed to see during my two years living in Hong Kong so I was keen to see what she had in mind. Here are her recommendations plus some pics I found on Pinterest! 3. Gyeongbok-gung palace: (Directions: Located behind the Gwanghwamun Gate at Gyeongbokgung Station Line 3) Seoul’s grandest palace which was bombed by the Japanese. Parts have now been restored and the vast grounds also house the Joseon Palace Museum and the Korean Folk Museum. 4. Changdeok-gung palace: (Directions: Located near Anguk Subway Station Line 3) Another palace, but with a beautiful garden which used to be private for royalty only! They offer a limited number of tours per hour. 5. Bukchon Hanok Village: This village has the largest cluster of privately owned traditional Korean wooden homes or hanok in Seoul – beautiful place to wander around in with many Korean tea houses. Perfect to spend the Sunday! 5. Noryangin Fish market: Original fish market with over 2000 stores – you can buy your fresh fish there and get it cook by one of the local restaurants where you can have your dinner! 9. Namdaemun & Myeongdong: Large markets for shopping for ANYTHING! Fun to go at night and finish at 4 am with lots of really good street food as well! 10. Itaewon: International are in Seoul, lots of super fun restaurants and bars etc. 11. 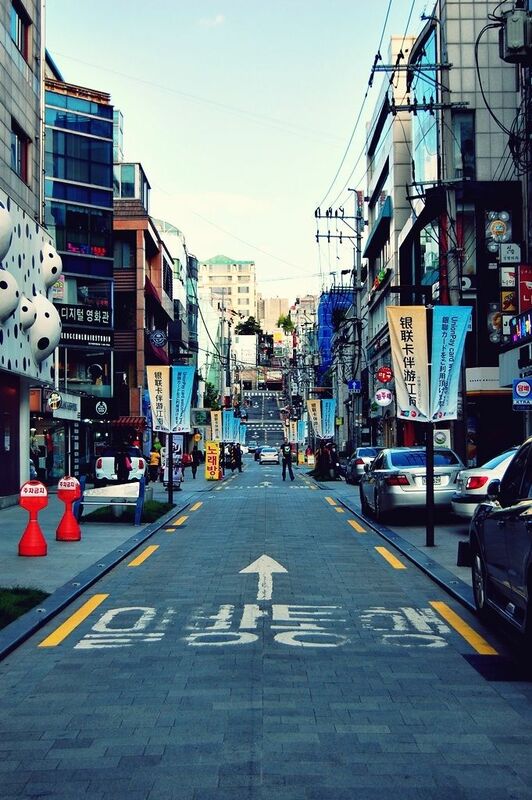 Apgujeong area: High end are with lots of shopping and great restaurants! 12. Gangnam street: Nice to check out and lots of restaurants in the area! 2. Cosmetics: Koreans are obsessed with masks and creams etc. the local brands like FaceShop are really good! Transport: The metro which is super organised and all the subway stations are mini shopping areas which is fun to see! – Bukchon Hanok Village: Tours are available and recommended, fully represents Korean life and its evolution. – DMZ: The border with North Korea, often referred to as one of the most dangerous places in the world. * Sanchon: Traditional Buddhist Temple Food at Sanchon, the most popular restaurant in Korea for Buddhist temple vegetarian cuisine. * Regular street food: Try it – there’s a lot of really good street food in Seoul! Just avoid the silk worm cocoons… ??? * The Lamb Kitchen: Amaaaaaazing lamb bbq with great red wine!!! * Modern Babsang: A nice intro to Korean food, owned by Psy’s mom. Thanks so much YKK for the recommendations and be sure to enter the Crust competition so you can have a chance to win and see countries like South Korea.